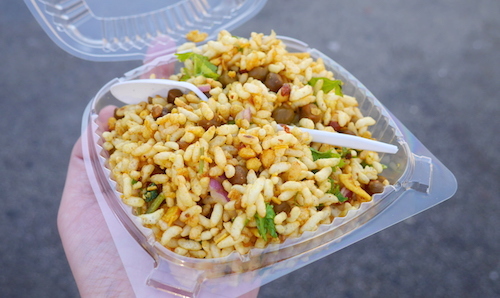 Jhal muri is the Bengali version of a popular puffed rice chaat snack bhelpuri that is eaten all over India. When I was in Kolkata, walking the streets would invite opportunities to sample from many carts. 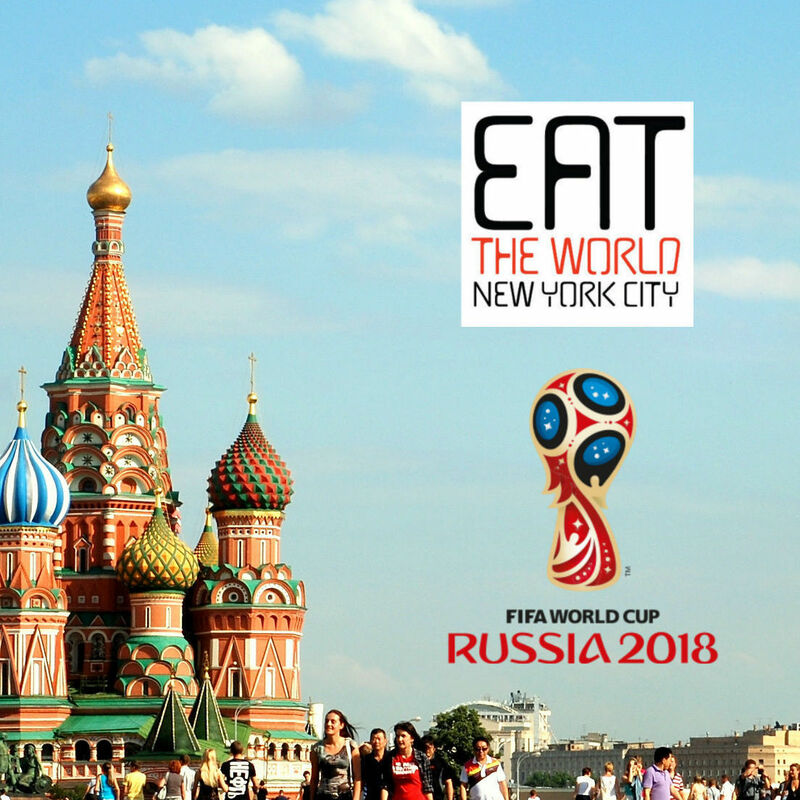 It is hard to walk a block there without seeing a kati roll stand or jhal muri cart, and usually both. Of course, the Bengali snack is known to set your mouth on fire as many Bengali foods do, and is usually served in a folded page of yesterday's newspaper. 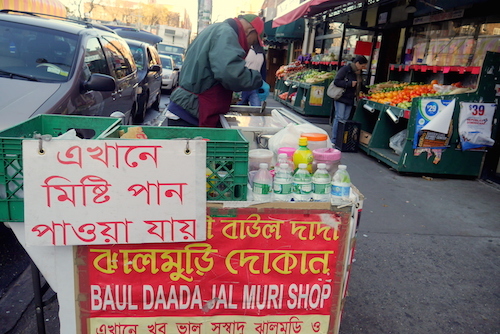 In Jackson Heights, a friendly man sets up his little cart on 73rd Street each day after 3pm or so and plies his trade to passersby. Make an order (point, smile, stand there and shake your head), and watch him assemble your snack from about ten bottles and containers. I found his version much wetter and less crispy than Kolkata versions, most likely due to his ample use of multiple chutneys and mustard oil. The latter is used in generous portion when you say you want it spicy. Those that enjoy spicy snacks will get their kicks from this jhal muri (above). The other ingredients (onions, cilantro, tomatoes, roasted soybeans, and chickpeas, amongst others) are no match for the intense spice in the dish. I enjoyed myself but had to give in and buy a bottle of water about halfway through. I do not recommend dumbing it down, but you can tell him mild if necessary. It is not a full meal, but can be combined with a larger plate from a nearby sweets shop or anything else. It is just the simple enjoyment of getting a little piece of West Bengal from a Queens street.